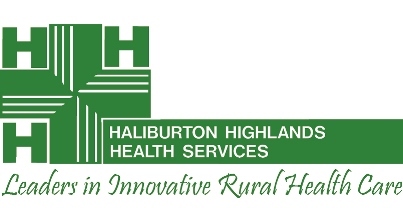 The Haliburton Highlands Health Services (HHHS) has a great opportunity for an Emergency Medicine Physician to provide patient care to a wonderful and appreciative community at the Haliburton site. The Haliburton Emergency Department is a busy rural community hospital which sees an average 15,000 visits per year, and has excellent in-house and referral centre support. The successful applicant must be eligible for independent practice licensure with the College of Physicians and Surgeons of Ontario with CCFP (EM) certification or CCFP with experience is preferred. In addition, the candidate must have ACLS and ATLS certification, and PALS is an asset. Emphasis will be placed on candidates with strong communication skills and experience working in rural environments. Family Medicine positions are also available within the community. ER Physicians are paid under the AFA (Alternate Funding Agreement). Also available is a financial incentive program offered through the County of Haliburton for $25,000 per year to a maximum of $150,000 for physicians who commit to practicing full-time for a minimum of four (4) years in either the Minden Emergency Department or the Haliburton Emergency Department, or a combination of Emergency and Family Practice.